Close to everything you could need for a sun-soaked beach break, the recently refurbished 3-star Blue Sea Arenal Tower provides a comfortable and great-value base for your Majorca holidays. 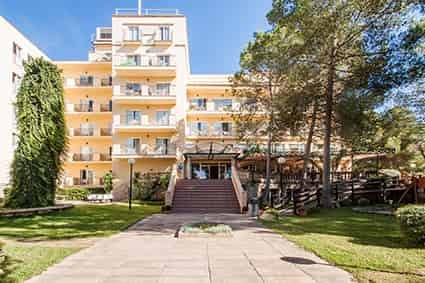 Positioned just a few minutes’ walk from the golden sands of El Arenal, guests are ideally located to enjoy Majorca’s fantastic climate, delicious restaurants and lively bars. 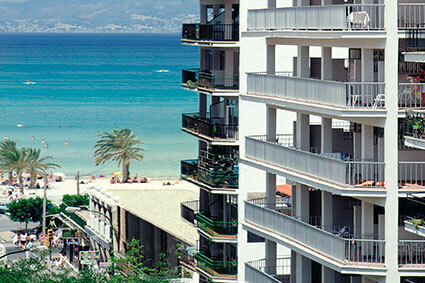 The hotel is also just a short drive from Palma Airport, meaning there’s no need for long and tiring transfers. Blue Sea Arenal Tower Hotel features 152 simple and pleasantly decorated rooms located over 10 floors, each complete with en-suite bathroom and private balcony or terrace ideal for soaking up the Spanish sun and free WiFi. For those down times between the beach and sightseeing, the Arenal Tower Hotel has two outdoor pools and provides the perfect spot to relax and enjoy a drink. The main pool schedule is from 10:00 to 18:00. Choose from the small rooftop pool with beautiful views of the resort and the Bay of Palma, or the large terrace pool with sun beds and snack bar. If the sun gets too much, you’ll find a games room complete with pool table, TV lounge as well as the hotel restaurant and bar on hand for entertainment, drinks and buffet meals. When the sun sets, relax in our rooftop Sky Bar*. Admire the magnificent views of the Bay of Palma and the stunning sunsets whilst enjoying your favorite drink! Live some unforgettable moments with your friends and family. We’re sure that you’re going to love it! Those looking to get out and about to discover the island can find help and advice at the 24-hour reception, along with bicycle and car hire facilities. For a sunny beach getaway in Majorca that can be as relaxing or as lively as you’d like, the Arenal Tower Hotel will tick all your holiday boxes. *Sky Bar drinks not included with the All Inclusive package. These comfortable double rooms are refurbished with wooden floors, twin beds, an en-suite bathroom, private balcony or terrace, air conditioning, TV, free WiFi and safe. These comfortable double rooms are refurbished with wooden floor, include twin beds, an en-suite bathroom, private balcony or terrace, air conditioning, TV, free WiFi and safe. All this rooms offer sea view. Single rooms at the Arenal Tower Hotel provide a comfortable base for solo travellers or those in need of their own space, complete with en-suite bathroom, private terrace or balcony, air conditioning, TV, free Wifi and safe. Opt for an all-inclusive package at the Arenal Tower Hotel and enjoy buffet-style breakfast, lunch and dinner from the spacious dining area throughout your holiday. In additional, guests can make the most of the snack bar where light meals are served, as well as unlimited drinks from the hotel bar (brand name spirits are charged additionally). The all-inclusive package runs from 08:00 until 23:00. The restaurant at Arenal Tower Hotel is on hand to provide guests with delicious buffet-style meals during breakfast and dinner. Serving a range of international and local dishes, including hot choices, a salad bar and a range of desserts during the evening, the roomy dining area is fantastic for refuelling before or after a day on the beach. The hotel snack bar is available for light snacks and drinks during the day. Located near to the pool, it offers a range light bites and is open between 10:00 and 18:00. The idyllic location of Blue Sea Arenal Tower Hotel places guests moments from the bustling center of El Arenal, a fantastic spot to enjoy the many attractions and sights of this stunning beach resort. The area’s long stretch of soft white sands and clear waters are just 200m away, or less than a five minute walk from the hotel, making it a great choice for those in search of a getaway with plenty of sun, sea and sand. You’ll also find water sports, sun beds and beach huts selling snacks and drinks set up along the length of the traffic-free, flat promenade. Those looking to explore the picturesque island of Majorca could not be better placed. Public transport is available 100m from the hotel with regularly buses running to Palma, C'an Pastilla and further afield. Nearby family attractions include the Aquarium in Palma, Golf Fantasia and the island’s biggest water park, Aqualand, which are located in El Arenal. There are also a number of colourful markets held most mornings in the area, including the famous Thursday market, the perfect place to pick up a few souvenirs. Visitors hoping to make the most of the local nightlife will find a number of vibrant bars within walking distance of Arenal Tower Hotel. Or for an even livelier night on the town, make the short journey to the energetic capital of Palma and experience a huge range of bars and clubs offering everything from international DJs to live music and theme nights.